A driver who died along with five others when he lost control of his Audi at 100mph had cannabis in his system, an inquest has heard. Birmingham Coroner's Court heard Kasar Jehangir's car ploughed sideways into a taxi coming the other way on Belgrave Middleway in Birmingham in December. Taxi driver Imtiaz Mohammed, 33, was killed, along with passengers Lucy Davis and her partner Lee Jenkins. A coroner concluded that the trio in the taxi died as a result of a crash. Senior coroner Louise Hunt said: "Fundamentally, the cause of the collision was as a result of excessive speed." She added that raised levels of chemical THC, from cannabis, found in Mr Jehangir's system "contributed to the manner of driving, and therefore contributed to the collision". She said: "Before the collision occurred, it's likely the Audi was travelling between 94mph and 100mph in a 40mph limit." PC Keith Evans told the inquest the Mr Jehangir and two of his passengers Tauqeer Hussain, 26, and Mohammed Fahsha, 30, were all thrown from the high-powered Audi S3 and suffered fatal "catastrophic head injuries". The only survivor from the Audi, Zakkria Khan, 18, denied that the car's occupants had been out dealing drugs, but admitted he had smoked some. However, Sgt Alan Hands told the inquest: "Based on the movements of the vehicle, intelligence surrounding this vehicle and the occupants, it would be a reasonable grounds to suspect they were in the area, dealing drugs from that car." 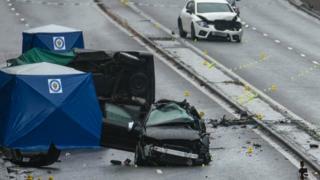 Tests found Mr Mohammed had traces of cocaine and another substance in his system, though this was "not a factor" in the crash on 17 December according to the collision investigator. The inquest heard Mr Mohammed was not wearing his seat belt, but it would not have made a difference. He and his passengers Ms Davis, a 43-year-old mother of two, and 42-year-old nuclear physicist Mr Jenkins - who were both wearing belts - all died from multiple injuries. Image caption Imtiaz Mohammed's family said he was "working hard to make a living and provide for his family"
Mr Jehangir's Audi had two defective tyres and no-one in the car was wearing a seat belt, the inquest heard. The coroner was told he was also found to have been carrying about £1,000 in cash. The inquests of the Audi's occupants are due on Wednesday. The driver and passenger of a Toyota Yaris, which was struck by the taxi, suffered only slight injuries. In a statement read at the hearing, Mr Jenkins's family said: "It is perhaps fitting Lee would find love with Lucy, someone equally positive, full of life and who shared a love of doing things." Mr Mohammed's family have described him as "a legend".